Today we celebrate the greatest creation to ever come out of a camping trip: the s’more! While it’s perfectly acceptable to keep things classic, we encourage you to think outside the campfire and try a gooey, chocolatey, s'mores-inspired dessert. Here, seven killer s'more innovations to make on National S’mores Day! While baking these sweet flatbreads in the oven is easier, they're also delicious grilled. Semifreddo, the luscious Italian dessert, is cold and creamy like ice cream but much simpler to make. Pastry chef Mathew Rice's favorite is toasted marshmallow, which he serves with salted milk-chocolate sauce and graham crackers—an homage to s'mores, and what he calls his "holy trinity." These fudgy gluten-free brownies are baked in a graham cracker crust, then topped with marshmallows and broiled. This hearty twist on s'mores is made with chocolate-studded biscuits instead of graham crackers, along with tangy raspberry jam and smoky marshmallows. 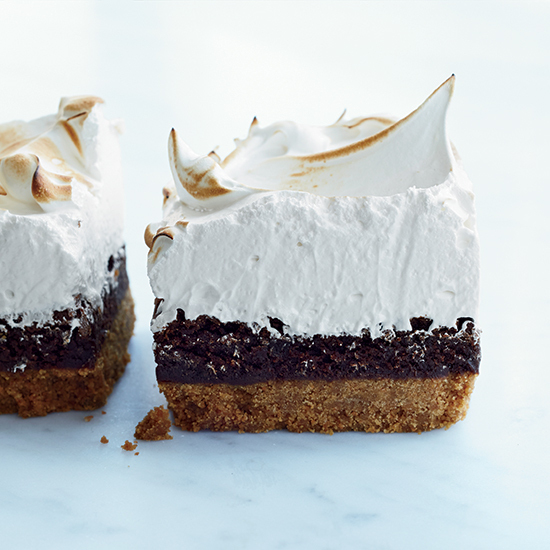 These crazy-delicious bars feature a salty, crunchy graham cracker crust topped with a rich chocolate filling and fluffy, light, marshmallowy meringue. In this take on the campfire classic, crunchy graham crackers are replaced with buttery store-bought pound cake, sandwiched with marshmallow fluff and peanut butter, and served alongside a cup of warm melted chocolate for dipping. Here, milk-chocolate squares are swapped for luscious Nutella, giving these s’mores a rich hazelnut flavor.